In chapter 14 of Planning the Pacific Northwest, I examined tools for shoreline development and green standards applied in communities throughout the region known as the Salish Sea, which includes Bellingham, Washington, and Vancouver, British Columbia. As the effects of climate change are increasingly evident, coastal communities need not only “grow green” but also must protect themselves from climate-related hazards. These pressing needs spurred the development of Green Shores for Homes (GSH), a voluntary, incentive-based credit and rating system designed to help coastal homeowners protect their property and prepare for the effects of climate change using alternatives to hardened shorelines. The program focuses on two primary concerns: preparing for coastal impacts from climate change and addressing impacts to habitat. Before: Wishing to replace the aging concrete bulkhead that extended the length of the shoreline and remodel the guest house that stood some 20 feet from the shoreline, the owners of this Lake Washington residence were attracted to "natural shore" methods used to protect the shoreline in a nearby park. Photo by the Watershed Company. After redevelopment: Photo by the Watershed Company. Design by Paul Broadhurst and Associates. 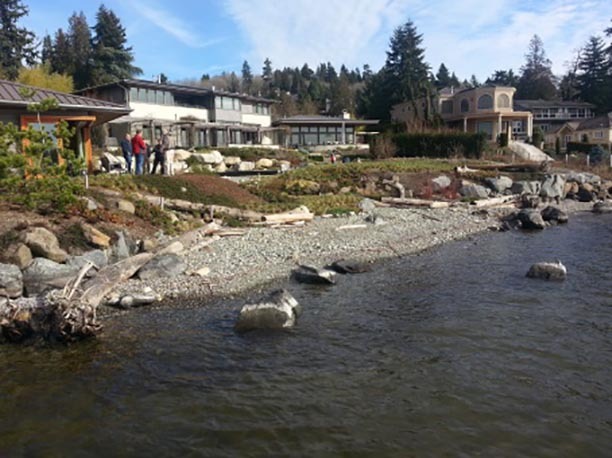 In the region, there is a growing awareness of the impacts of hardscape shore protection on the natural environment. At the same time, soft shorelines are gaining recognition as one adaption technique to address impacts from increased coastal storms and rising sea levels. Jurisdictions seek regulatory solutions for protecting the environment and encouraging adaptation to climate change. The need to address adaptation to climate change has sparked response from local, state, and provincial governments. The Green Shores for Homes program offers these jurisdictions guidance, a process to follow, and potential incentives to achieve these goals. Unique for its international component, the GSH program brings together U.S. and Canadian partners, including a 12-member technical team with a broad range of expertise — landscape architects, planners, marine biologists, coastal geomorphologists, engineers, and homebuilders. Over the past four years, the team developed technical guidance for restoring and preserving shorelines using “soft” or “green” approaches, trained independent verifiers, and developed courses to train planners, developers, contractors, realtors, and others on how to apply these methods. Up to 22 specific credits may be earned in four credit categories. 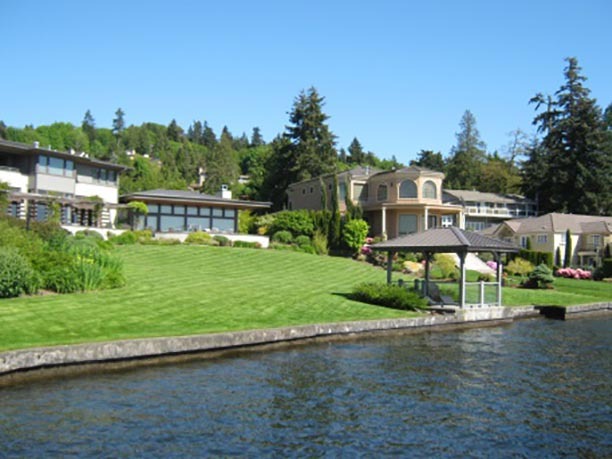 "Shoreline Process" credits address sites with no shoreline protection, building setbacks, and actions to reduce or reverse cumulative impacts from existing developments such as bulkhead and groin removal. The "Soft Shore Protection" credit encourages alternative approaches to shoreline hardening but requires the applicant to demonstrate that shoreline protection is needed. "Setback and Managed Retreat" credits include consideration of projected sea level rise. Soft shore alternatives are critical. They allow property owners to address erosion in an ecological manner while mitigating the impacts of increased coastal inundation from climate change. The Green Shores for Homes program provides a crucial pathway for property owners to protect and restore their shorelines with the support of local jurisdictions, conserving and enhancing coastal ecology and human wellbeing for future generations. Nicole Faghin, LEED AP, is a coastal management specialist at Washington Sea Grant based at the University of Washington in Seattle. In her education, outreach, and research, Faghin focuses on resilience related to social, economic, and environmental shoreline planning efforts, including working waterfronts. Faghin holds a master's in city planning from MIT and a law degree from Northeastern University. Top image: Detail of Planning the Pacific Northwest cover. Thinkstock photo.